First Lt. Arlen Richardson sits behind the controls of the Army Huey helicopter he piloted in Vietnam. The Lawrence man, who was killed with the other 10 men aboard when the helicopter crashed after experiencing mechanical problems, will be honored Sunday, May 27, 2018, at the NASCAR Coca-Cola 600 with his name written on the windshield of the car driven by current NASCAR champion Martin Truex. 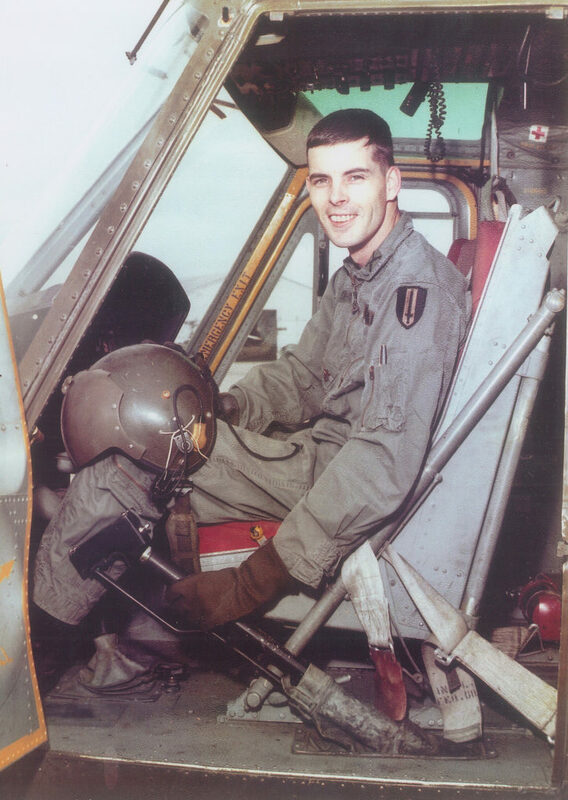 Lt. Arlen Del Richardson was just 40 days into his tour in Vietnam when the Army helicopter he was piloting experienced mechanical failure and crashed in the Quang Ngai Province, South Vietnam, killing all 11 people on board. The Lawrence resident was just 27 years old, and his son Ryan Richardson was just five months old. It was near Memorial Day last year than Ryan Richardson realized there might be a unique — and nationally visible — way to honor the memory of his father. The stock car racing circuit NASCAR annually honors the military each year at the Coca Cola 600, which is held each Memorial Day Weekend at the Charlotte, N.C., Motor Speedway. This year, Arlen Del Richardson’s name will be written in script across the top of the windshield of current NASCAR champion Martin Truex Jr.
Ryan Richardson, a Lawrence High graduate who now lives in Denver, Colo., is familiar with NASCAR because his mother, Sharon Martin Draper, is now married to Ed Draper, the chief financial officer for the Denver-based company Furniture Row. Furniture Row Racing and its owner Barney Visser sponsors Truex’s car. Richardson approached the company, and now Lt. Richardson’s name will be part of the special race-long memorial, which NASCAR calls 600 Miles of Remembrance. Ryan Richardson said the family is beyond appreciative of what Truex’s team and his sponsor is doing to honor his father. “I don’t think they understand the depth of what that means to us,” Richardson said. If Truex’s track record in his No. 78 race car is any indication, Lt. Richardson’s name will get significant national exposure as the Furniture Row car circles the speedway at or near the lead. Truex won the Coca-Cola 600 two years ago. In some ways, it is appropriate that Lt. Richardson’s name will be on a car. It was a car that brought together Arlen and Draper. Arlen first met Draper when he came to her father’s Lawrence home to look at a car that was for sale. A few days later, Arlen and Draper ran into each other again. Richardson asked her to go out with him the next day. The story illustrates how his brother packed a full life in his short 27 years, said younger brother Daryl Richardson. It was a character trait their parents Clara and Delbert Richardson encouraged through the siblings’ Kansas Kids trick riding troupe that performed on a regional circuit that stretched as far south as Oklahoma. Arlen and their older sister Clarice (Patchen) were the accomplished stars of the show, said Dee Dee Commons, the youngest of the Richardson children. The first-date story also reveals his passion for flying that their older brother shared with their father, who owned a small two-seat airplane and maintained a small airstrip at the family homestead in the 2500 block of Haskell Avenue. Arlen Richardson got his pilot’s license at 16, Daryl Richardson said, noting the pilot’s lounge at Lawrence Municipal Airport is named for his brother and father. Arlen Richardson is buried in Oak Hill Cemetery. Daryl and Dee Dee haven’t missed a Memorial Day ceremony at the cemetery since his death, but they will this year. They are attending the Coca-Cola 600 with Draper and her current husband, their nephew Ryan, and Draper’s younger son Mark. Draper said the family is in for a special day. “It’s going to be an emotional roller coaster,” she said.